Ce document au format PDF 1.5 a été généré par Microsoft® Word 2010, et a été envoyé sur fichier-pdf.fr le 05/12/2017 à 16:55, depuis l'adresse IP 89.92.x.x. La présente page de téléchargement du fichier a été vue 219 fois. Taille du document: 3.7 Mo (57 pages). apologize in advance for my loose use of language and imperfect analogies. pneumatic tubes used to send mail and packages within and between buildings. high that this is impossible for all practical purposes. the hundreds of miles of tube and the whole system stops working. transport pods could handle variable air density would be inherently robust. and leads us straight into another problem. in the system. Not good. in the head of the syringe actively relieving pressure. tube, as it is important to make the tube as low cost and simple as possible. pod is not drawn from the battery pack. several tens of billion proposed for the track of the California rail project. minor deviations when the highway makes a sharp turn. to be taken lightly, as demonstrated by several recent fatal train accidents. subtle, large scale land movement. (XY) dampers and one vertical (Z) damper. cumulative length change of the tube. 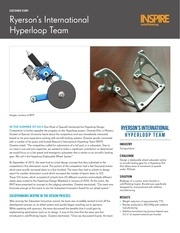 advance the Hyperloop design and bring it from concept to reality. supported on a cushion of air, featuring pressurized air and aerodynamic lift. various stations on the low pressure tube with rotors contained in each capsule. of the tube, or branches along the tube length. dollars) plus operating costs per one-way ticket on the passenger Hyperloop. requirements of Hyperloop is the fully electric Tesla Model S.
size automobiles with passengers to travel in the capsule. miles (37 km) on average during operation. compressed air reservoir and aerodynamic lift. b. Pylons are placed every 100 ft (30 m) to support the tube. at various locations to accelerate the capsules. capsules via the linear accelerators. stations along the way will be possible with splits in the tube. Figure 2. Hyperloop conceptual diagram. Figure 3. Hyperloop tube stretching from Los Angeles to San Francisco. the time between capsule departures could be significantly shortened. version and a passenger plus vehicle version. unloading of the passengers in approximately 5 minutes. aerodynamic resistance, and input eight times the power. expensive and difficult to maintain compared with low pressure solutions. Despite the low pressure, aerodynamic challenges must still be addressed. 760 mph (1,220 kph, Mach 0.91 at 68 ºF or 20 ºC). the outer mold line (Figure 4). Figure 4. Hyperloop passenger capsule subsystem notional locations (not to scale). Figure 5. Hyperloop passenger transport capsule conceptual design sketch. Figure 6. Hyperloop passenger transport capsule conceptual design rendering. ‘compressor within a tube’ concept (Figure 7). Figure 7. Streamlines for capsule traveling at high subsonic velocities inside Hyperloop. not including any propulsion or suspension components. front or rear of the capsule. the structure including manufacturing is targeted to be no more than $245,000. of vehicles, passengers, or freight. the structure including manufacturing is targeted to be no more than $275,000. their own personal entertainment system. Figure 8. Hyperloop passenger capsule version with doors open at the station. Figure 9. Hyperloop passenger capsule version cutaway with passengers onboard. interior and door panels, luggage compartments, and entertainment displays. (639 lb or 290 kg total mass of coolant). the travel time with added reserve backup power. Figure 10. Compressor schematic for passenger capsule. (1,800 lb or 818 kg total mass of coolant). Figure 11. Compressor schematic for passenger plus vehicle capsule. Figure 12: Schematic of air bearing skis that support the capsule. (160 kph) and as a component of the overall safety system. 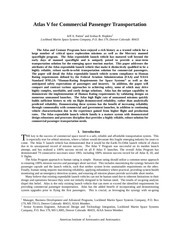 thin air film: external pressurization and aerodynamics. trap a thin film of air in the converging gap between the ski and the tube wall. increase as the capsule accelerates into the transonic regime. kph) is 31 lbf (140 N), resulting in a 64 hp (48 kW) power loss. be no more than $475,000. components is targeted to be no more than $565,000. the cost of the suspension system. 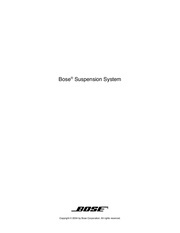 addition to the cost of the suspension system. the vehicle. More details can be found in the section 4.3.
near 2,900 lb (1,300 kg) including the support and emergency braking system. near 3,500 lb (1,600 kg) including the support and emergency braking system. approximately 1% of the total budget. increased to 10 ft 10 in. (3.3 m). Figure 13. Typical vacuum pump speed for functional pressure range. available for the route in section 4.4.
will glide with little drag via air bearings. version of Hyperloop or the passenger plus vehicles version of Hyperloop. tube is bypassed using the onboard compressor in each capsule. Figure 14. Hyperloop capsule in tube cutaway with attached solar arrays. compressor of each capsule, which increases power requirements. detailed power requirements will be detailed in section 4.3.
all required vacuum pumps is expected to be no more than $10 million USD. ports will be added in key locations along the length of the tube. 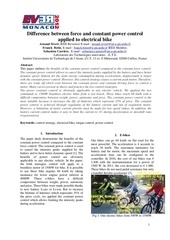 weight and acceleration, as well as seismic considerations. increase is kept to a minimum. be smooth and welded along the high speed gliding middle section. the spacing will have to vary in order to pass over roads or other obstacles. for the larger diameter tube. tubes to isolate movements in the ground from the tube. Figure 15. First mode shape of Hyperloop at 2.71Hz (magnified x1500). Figure 16. Second mode shape of Hyperloop at 3.42Hz (magnified x1500). Figure 17. Deformation at 1g Inertia in X (in.) (magnified x10). Figure 18. Maximum principal stress at 1g Inertia in X (psi) (magnified x10). Figure 19. Minimum principal stress at 1g Inertia in X (psi) (magnified x10). Figure 20. Maximum shear stress at 1g Inertia in X (psi) (magnified x10). and with a boarding process and layout much simpler than airports. contrast to the pulsed situation at airports which leads to lines and delays. and unloading passenger luggage in order to maximize efficiency. occurring in parallel with up to three capsules at a given station at any time. total of $250 million USD initially. solar panels. The tube represents approximately 70% of the total budget. allow a much more versatile Hyperloop system. speed travel in urban areas. ascents over the mountains surrounding Los Angeles and San Francisco. at the beginning of the long coasting section along the I-5 corridor. 4. To decelerate the capsule back to 300 mph (480 kph) at the end of the I5 corridor. does not require rare-earth elements. keeping the rotor aligned in the air gap. factor seen by the inverters. and 760 mph (480 and 1,220 kph). 4.0 in. (10 cm) tall, and weighs 530 lb/ft (800 kg/m). DC/DC converter to connect it to the propulsion system. costs together for linear accelerators add up to $140 million USD. hp (21 MW) and are expected to cost approximately $210 million USD. the wider tubes (122,000 hp or 91 MW, on average) to provide this. etc. The route must respect existing structures. miles (4.8 km) or where local geography permits a straight tube. allow a degree of ‘banking’. The Hyperloop route was created by the authors using Google Earth. Figure 25. Overview of Hyperloop route from Los Angeles to San Francisco. earth removal, constructing pylons to achieve elevation change or tunneling. 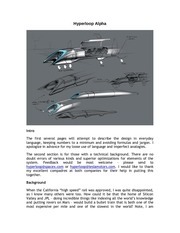 300 mph (480 kph) for the Los Angeles Grapevine South section at 0.5g. 555 mph (890 kph) for the Los Angeles Grapevine North section at 0.5g. 760 mph (1,220 kph ) along I-5 at 0.5g. function of time summarize the route. Figure 26. Velocity of capsule as a function of time from Los Angeles departure. 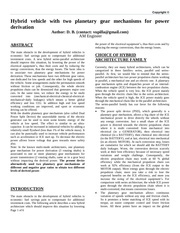 Figure 27. Distance of capsule as a function of time from Los Angeles departure. north/south Grapevine definition in this document. Follows I-5 through Santa Clarita and Castaic. Figure 28. Los Angeles/Grapevine South Section of proposed Hyperloop route. Table 3. Los Angeles/Grapevine South data at 300 mph (480 kph). radius and develop straight sections. Figure 29. Los Angeles/Grapevine North Section of proposed Hyperloop route. Table 4. Los Angeles/Grapevine North data at 555 mph (890 kph). Follows I-5 to minimize land/right of way purchase costs. Figure 30. I-5 Section of proposed Hyperloop route. Table 5. I-5 Section data at 760 mph (1,120 kph). Follows I-580 to minimize land/right of way purchase costs. Figure 31. I-580/San Francisco Bay Section of proposed Hyperloop route. Ce fichier a été mis en ligne par un utilisateur du site. Identifiant unique du document: 00562143.